Infinity Falls™ – featuring roaring rapids, soaking fountains and a record-setting 40-foot waterfall drop – is now open at SeaWorld Orlando. 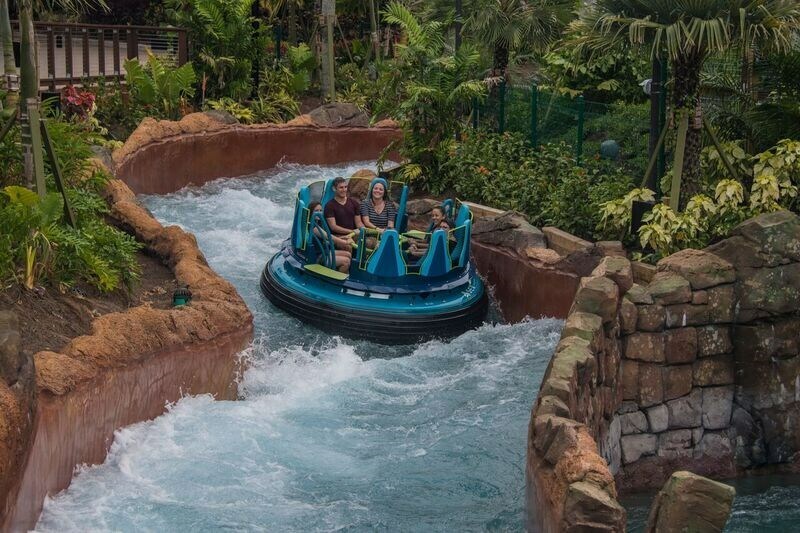 Set against a rainforest backdrop, SeaWorld Orlando's Infinity Falls is the centerpiece of a newly themed area designed to resemble the basecamp of explorers and scientists. The entire family can explore the basecamp and take part in interactive experiences that combine fun with education to learn about the importance of freshwater ecosystems and efforts being taken to make an impact in the real world. Infinity Falls brings the thrill of white-water rafting into a new experience the family can enjoy together. Aboard 8-passenger circular rafts, riders embark on an adventure through a lush rainforest environment inspired by some of the world's most incredible freshwater ecosystems. 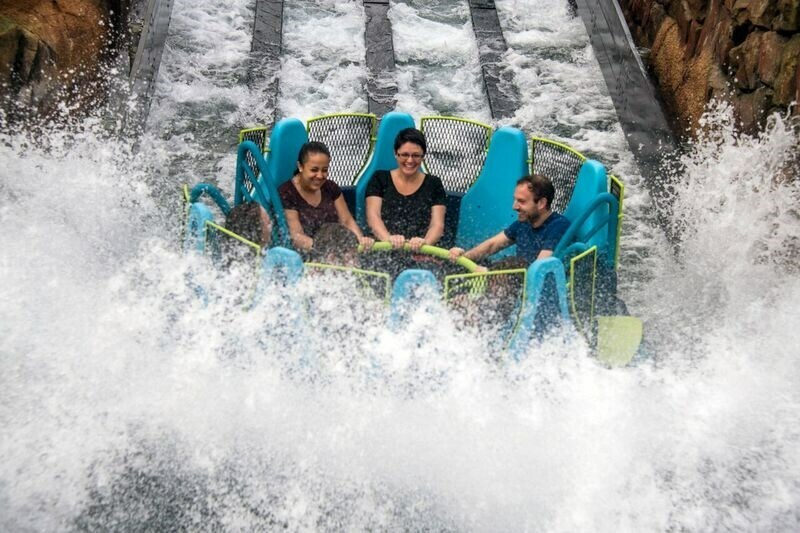 The new attraction features dynamic drops and turns, interactive water elements, and allow guests to experience the feel of exhilarating rapids. The ride also features an innovative elevator lift designed to transport the rafts to the top of the ride's 40-foot drop. Infinity Falls is the first attraction at SeaWorld to tell a story beyond the ocean and share a message of water conservation through the adventure of a white-water river expedition, bringing to life the company's Park to Planet® mission to help guests understand some of the challenges facing the planet and inspiring them to help. Earlier this year, SeaWorld and Coca-Cola announced a joint $100,000 donation through the SeaWorld & Busch Gardens Conservation Fund, in partnership with The Everglades Foundation, to support a freshwater replenishment project with Audubon Florida. The project will help replenish an estimated 37 million gallons of water within the Western Everglades at Audubon's Corkscrew Swamp Sanctuary in Naples, Florida. The new realm boasts a gift shop where guests can purchase Infinity Falls-themed merchandise and donate 5 percent of the net proceeds to The Everglades Foundation Literacy program, which provides K-12 educators with the curriculum and tools to educate young Floridians about the ecological and economic impact of the ecosystem. The park's new restaurant, Waterway Grill™, is also located next to Infinity Falls featuring flavors inspired from regions around the Amazon and a selection of Craft Beers. Jennifer Diaz, the Director of Education at The Everglades Foundation adds, "Educating the next generation of Floridians, coupled with the leadership and actions today is critical to the desired outcome: a restored and resilient Everglades. Thanks to our partnership with SeaWorld, we are continuing to advance the reach of the Everglades Literacy Program in Florida." The opening of Infinity Falls is the perfect addition to SeaWorld's ever-growing ride portfolio. From the roller coaster thrills of Mako, Manta and Kraken to the water flume fun of Journey to Atlantis, Infinity Falls joins the park's famed attractions as a must-do experience in Orlando. Mark Pauls, President of SeaWorld Orlando Parks said "From the excitement of the thrilling rapids, to the unique vertical lift element, Infinity Falls is an adventure that appeals to the entire family." "The opening of Infinity Falls is the beginning of an incredible and action-packed year ahead," Pauls continued. "We are proud to bring our guests more events, more rides, more thrills, and more value than ever before."